Kalklosch reported that the Post Office moved from Main Street to Spring Street in mid-1880. Cora Pinkley Call reported that the Post Office was located at Spring and Short streets in 1881 -- T.M. Johnson was Postmaster. Note: According to Cora Pinkley Call, (writing in 1930) Dr. Cochran was first Postmaster and probably would have housed the Postoffice in his general store. Note: According to Goodspeed,s History, written in 1888, Dr. McCarty was the first physician to Eureka Springs and was appointed the first postmaster. Note: According to L.J. Kalklosch, because visitors to the springs were experiencing an extended stay in the hills and gulches --- they petitioned for a Post Office in order to get mail. Kalklosch, in 1887, stated that the first Postmaster, Dr. McCarty, was jailed for Fraud in 1880. Cora Pinkley Call reported that the Post Office was located at Spring and Short streets in 1881, and T.M. Johnson was Postmaster. 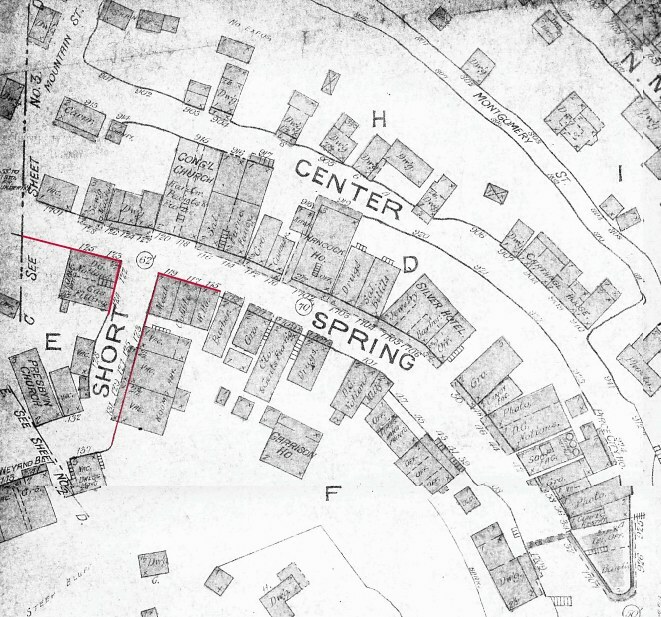 Short Street is no longer shown in 1892 Sanborn Map below. 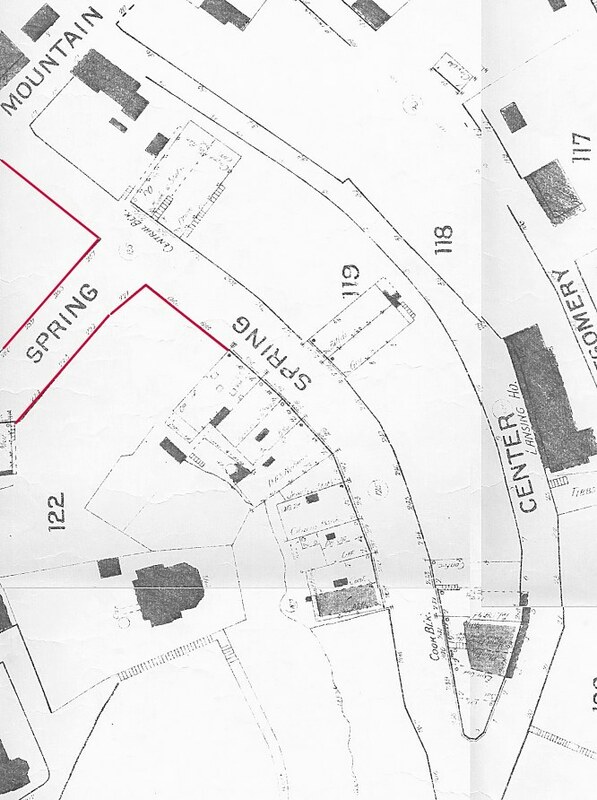 Short Street was renamed Spring Street as it connected lower Spring St. with upper Spring St. After the 1888 Fire, some streets were eliminated or re-arranged --- Notice, below, the many vacant spaces where buildings had not yet been rebuilt after the fire. In the below photo, the building housing the Post Office was located on Main Street in 1886, but destroyed by the 1890 fire and never rebuilt due to widening of Main and Spring streets. This was in the south end of the Montgomery Building. The Eureka Springs Post Office was established on October 21, 1879 with Aaron McCarty being the first postmaster. The postoffice moved several times during the early years primarily due to the frequency of downtown fires. During the 1880s, it was located on the Second Floor of the Montgomery Building — as was the Daily Herald Newspaper Office. 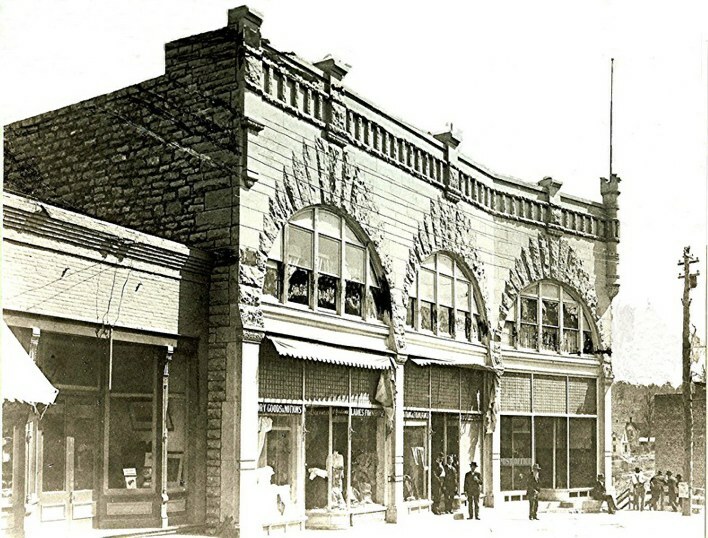 This Main Street location burned during the 1890 Fire that started in the nearby Perry House and was not replaced when street widening took priority after the downtown fires. Mail was brought to Eureka Springs by train and was redistributed to other places by stage coach, thus making Eureka the area distribution point. Below: The Ellis-Rosewater Building was built to provide the expanding need for postal services by the partnership of Dr. C.A. Ellis and Postmaster Benjamin J. Rosewater in 1900. The completed Ellis-Rosewater Building housed the Postoffice in the right most bay area. 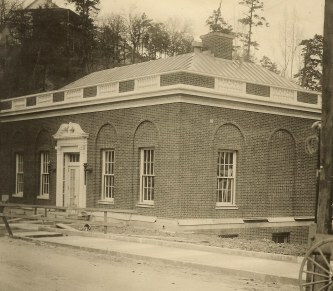 Below: Eureka Springs Post Office, as captioned in the archive photos of Eureka Springs Bank indicates the date of 1896. If so, Mamie Watkins would have been Postmistress. 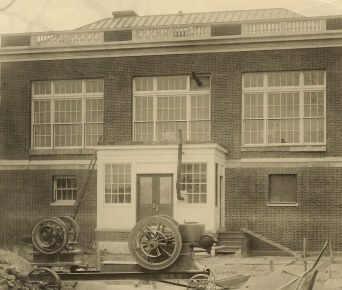 In 1918, the postoffice was removed to its present building at 101 Spring Street. 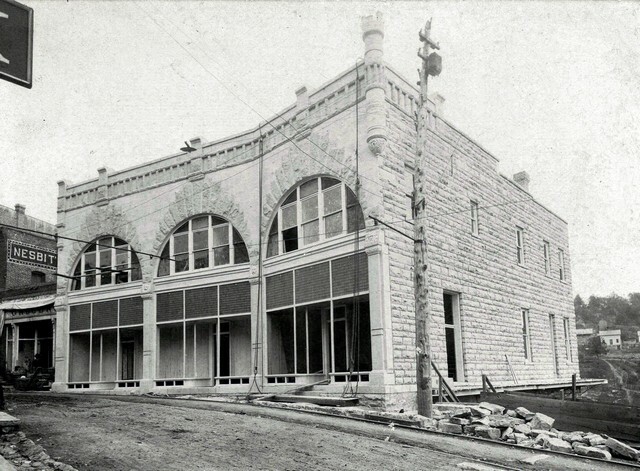 (Below Photos: show Front and Rear of new post office prior to 1918 move-in). Due to its historic significance, the postoffice maintained its original glass front customer mail boxes. Such boxes were removed from post offices nationwide for security reasons. During renovations the post office leased space at 9 N. Main for six months — only a 20 minute interruption of services existed upon returning to the newly enlarged building on Spring Street. In 1973, mail was delivered to two urban routes and two rural routes by eleven employees.